She holds a Master’s Degree in Obstetrics & Gynecology from Damascus University in Syria. 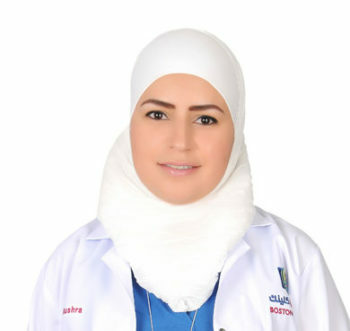 She obtained Syrian Arab Board Certificate in Obstetrics and Gynecology and is qualified for the Arab Board of Obstetrics & Gynecology from the Arab Council for Health Specialties. Dr. Bushra is Licensed Obstetrics and Gynecology Surgery Specialist from Ministry of Health in Syria. She worked in the Hospitals of Damascus and Istanbul. Performs Normal and Caesarean Delivery and all other Gynecology operations and performs Cosmetic Gynecology.